The statistics are not pretty, only 20% of marriages claim to be happy and fulfilling. Want to be in that 20%? Hear Cindy speak on Tuesday, November 5th, at 3 pm. In this broadcast, Cindy will give you information to help your relationship. Once you listen you’ll want more. 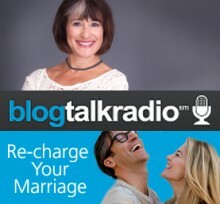 Her upcoming workshop will cover the subject more detail: Re-Charge Your Marriage – Weekend Intensive – February 1 & 2 in 2014 (re-scheduled from the 15th and 16th) in 2014. Get more information on our Event Calendar.